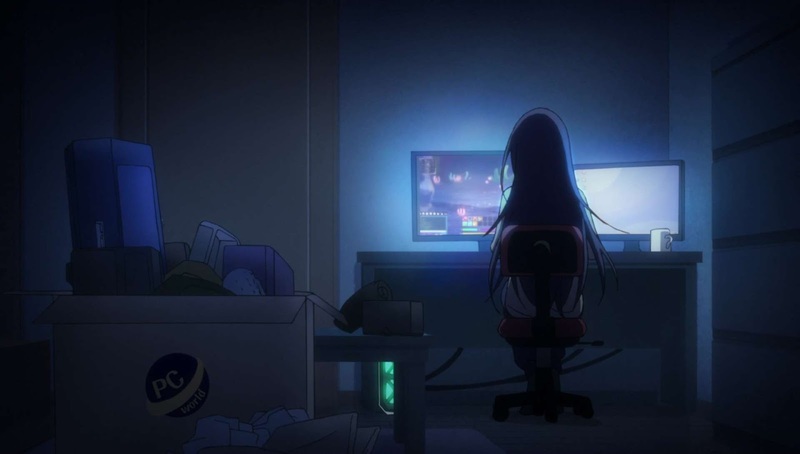 Today I will be reviewing an anime that is near to my heart, Recovery of an MMO Junkie. Now keep in mind this is my opinion, not fact. I hope you enjoy reading! 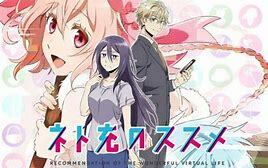 Recovery of an MMO Junkie is a slice of life Rom-Com that follows Moriko Morika (Mori Mori for short), a 30 year old NEET that quit her job to live in the online world of MMO's. After finding out that the server for the game she usually plays is shut down, she finds a new game called Fruits De Mer (shellfish)where she meets Lilly, a veteran player and her guild-mates. She creates a male character named Hayashi and develops a relationship with her newfound companion Lilly. Lilly happens to be a gentleman named Yuta Sakurai, a corporate employee that works with Moriko's old company but she has no idea about the identity of lily. Yes this is a convenient coincidence and there are many other coincidences in this series, however I feel that they were done correctly. As mentioned before this is Rom-Com, so yes there is a love story here, but its not as cheesy as others out there. It is however sometimes cringe worthy to see how awkward these two are at interacting with one another in real life.This anime is a perfect anime for those introverts who are awkward when it comes to social interactions because it is very accurate. There are so many things right with this anime, including subtle meanings and hidden Easter eggs. For example, the game they are playing is called Fruits De Mer, when translated from french to English it means shell fish. I think this is a metaphor for Mori Mori being stuck in a proverbial shell, her introversion. This story is filled with awkward social interactions and internal conflicts of several characters as they try to navigate their lives in game and in real life. Did I also mention the opening and ending themes are amazing? Because they are! I want to talk about all of the tropes in this anime as well. Boy are there plenty. Everything from the way the characters interact with each other in the game to different issues they have inter-personally is spot on accurate. The setting switches between in game and real life, and you can definitely tell the difference in the personalities of the group. As an avid gamer, I also notice these paradigm changes in myself When I play an MMO or any RPG. I try to make a character that not only compliments the good parts of my personality but also enables me to play a roll that is completely different than myself IRL. It gives me that ability to escape all of my problems and be who i want without fear of rejection or disapproval because I am sheltered behind another face and name. This is exactly how Mori Mori approaches her gaming experience as well as Yuta. The creators of this story were spot on when giving these traits to our protagonists. In another way they also captured other player types, not just the introverted addicts. One of the characters they play with in game is named Lilac, who IRL is a college student and plays a loli style character. In episode 4, "Like a Maiden in Love" the guild members are buying loot boxes to try and get rare items and gear, and lilac is able to obtain a rare gear-set that changes her appearance. She later changes it back saying its not her style. 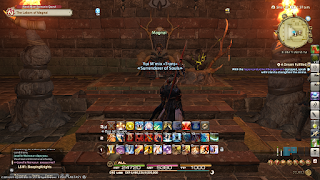 You see this type of player in MMO's often, one who is fixated on making their character look and act a certain way to keep up an appearance. Honestly this is also a trait of Mori Mori due to her choice of a character in Hayashi who seems to express everything she would want in mate, but there are still a lot of differences between them. Speaking of Lilac, like i mentioned before, its hard to find anything wrong with this anime as they did so many thing right, however there are a few things that I personally didn't care for. Keep in mine this is purely my opinion, but none the less it may be something that others struggle to grasp as well. I didn't like the lack of character development with the secondary characters. Although this is a very short series and it does wonders for the 2 main characters (Mori Mori and Yuta) I would have liked to see a little bit more from the side characters. In the first half of the series they made several appearances and also started bits of development, but during the second half of the series they just get thrown to the side as the relationship between Mori and Yuta develop. Unfortunately their relationship is able to develop because these side characters, like Koiwai and Kanabe (Kazuomi) who encouraged them to be more social with one another. Sometimes too much is a bad thing but I feel we could have at least got something. All in all that is really my only complaint about this anime. Its very cheerful, and keeps the comedy witty and interesting without being too aggressive. I encourage anyone that has ever played an MMO or online game to give this anime a try, I promise it wont fail you!